The single bantam version provides ten identical outputs from a single T1/ E1 input. 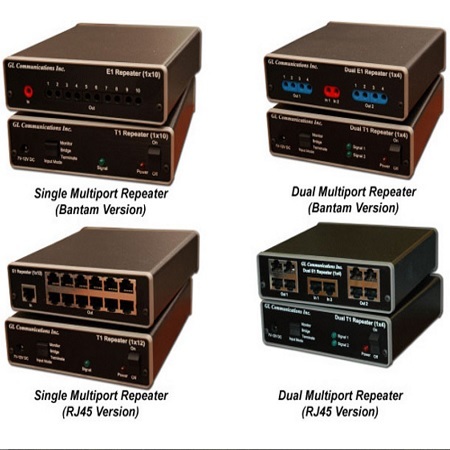 The single RJ45 version provides twelve identical outputs from a single T1/ E1 input. The dual version provides four outputs for each of the two inputs. The device is also useful in lab environments for load testing and signal duplication purposes. The output signals are regenerated versions of the input signal(s), that is, the input signal is detected via a data and clock detector circuit and regenerated at the output with identical line coding.